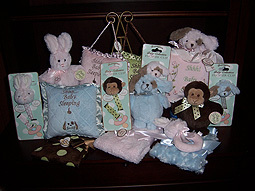 The Pampered Baby, Inc., located in Schereville, IN Northwest Indiana a different and unusual gifts for any baby occasion, showers to newborn baby gifts, boys and girls alike. Fill out the form to the right to ask a question, give your comments or tell us about your experience. This site best viewed at 800 x 600 resolution using IE 6 / Netscape 6 or better. © Copyright 2002-2011, Pampered Baby Inc.